Airads were at 'Glorious' Goodwood today but strangely enough, flying a banner promoting race days at the neighbouring Fontwell Park racecourse which now boast a new grandstand! Another busy weekend for Airads, with a marriage proposal flown by Bhavesh for 'Sonal' over Leeds Castle in Kent, Claire and Henry's wedding in Hockley, Essex and Adam & Alana's wedding at Salmestone Grange on the Isle of Thanet, to name but a few of the flights we made on one of the hottest weekends of the year so far. July and August are very busy months for us and so if you are thinking of booking your own wedding or romantic proposal flight, it's best to give us plenty of notice so that we can be sure to fit you into the schedule on any weekend. 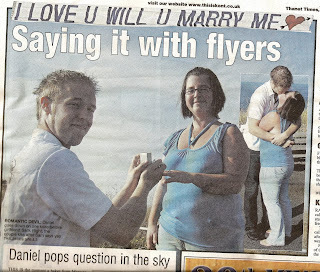 Here at Airads we are very proud of our as yet 'unbroken' record in flying marriage proposals as seen on TV and the newspapers. We gave up counting the number of successful banner flights a long time ago! During the summer months in particular both weddings and marriage proposals are a big part of our business over the weekends and it's not unusual to have two or three of these in a twenty-four hour period spread around the south and east of England; the most popular spots being Leeds castle in Kent, Brighton pier and Southend pier. The average cost of a plane banner proposal is about £450 (inclusive of VAT) but can of course vary, depending on where it's required. Of course, the closer to one of our aircraft it is (Leeds castle) the cheaper it is likely to be. Once the flight is booked, we don't talk again until a day or two before the flight to check the weather with the client. If the forecast is bad, the client can either choose an alternative date or accept a full refund; it's as simple as that. If the day involved is absolutely critical, then the client can negotiate with us to 'have a go' if at all possible in the circumstances, without compromising flight safety. Occasionally we can arrange for photographs of the banner in flight but this isn't always possible, so clients should ask us in advance if they are interested. Invariably, we find that in the excitement of the moment, the client rarely manages to get a good close-up photograph of the banner! Finally, picking-up and flying banners is one of the more challenging jobs in aviation with less than ten people able to do it in the UK. We work very hard on delivering the proposal to the exact spot at the exact minute with military decision but with aviation, there's always room for the unexpected. We do our very best to keep the client informed by SMS and or phone and it's extremely unusual to have a delay. We recognize the client is under a great deal of emotional pressure and we try and make the entire process as transparent and stress-free as humanly possible. Invariably, we will give a ten minute morning before appearing, just so the client is ready on time to 'pop the question' and hasn't lost the ring in one of his pockets! 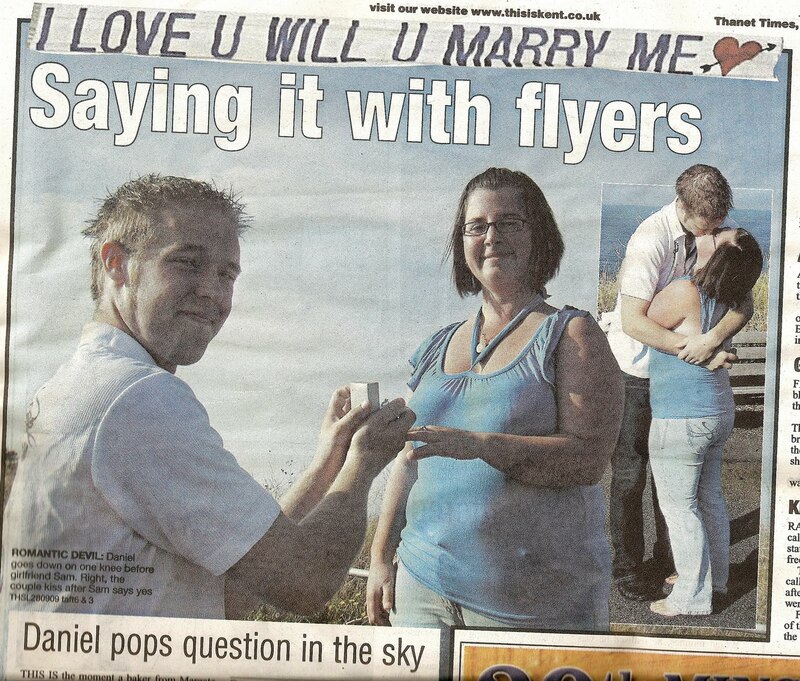 When she says 'Yes', send us a quick text, the pilot will waggle his wings and will leave you in peace to celebrate the moment quietly together! This interesting video on banner-towing from an operator in the United States, neatly sums up the challenges and the nature of the market for aerial advertising and aircraft banners on both sides of the Atlantic. It’s the Tolpuddle Martyrs Trade Union march again this weekend in the small village in Dorset that bears its name. Once again we’ll have two ‘ships’ over the top with banners for different Trade Unions, Joe Mann’s ‘Community’ and Bob Crow’s ‘RMT.’ I find it a little ironic at times that the Trades Union movement relies heavily on a Conservative-leaning pilot but they don’t seem to mind and last weekend I had a banner flying over the annual Durham Miners march. Sunday’s march recalls the events of 1834, when six farm workers from the tiny village of Tolpuddle in Dorset were sentenced to seven years’ transportation, a massive protest swept across the country. Thousands of people marched through London and many more organised petitions and protest meetings to demand their freedom. It's the middle of a very busy July for Airads, with weddings, proposals and music festivals going strong. However, I wanted to write a few words for our potential customers to help manage their expectations a little. You can find our condensed terms and conditions on our main website at www.airads.co.uk or simply ask us for a PDF copy with the full detail. However, very simply stated, if the weather is bad on the day of the flight, customers will normally receive a full refund, unless of course 'special conditions' apply, which normally involves sending us off to the location in the hope that the weather will be above our minimums at the specified time. We normally have the same questions asked of us several times a week, so here they are with the answers. Q. Can I have a banner flown over central London? A. No. This is not possible between London City airport in the east and Heathrow in the west and a line approximately ten miles north and south, almost in line with the boundary of the M25. Q. Why is it more expensive to have a banner near where I live? A. It depends on where you are? There are principally five operators in the UK and these are widely spread out. Airads partners with all of these to provide a national service but some spots, such as the north-east, south-west and Birmingham have no aircraft within a hundred miles and so it costs an incremental cost in aviation fuel to provide a service and this can be expensive at £150 an hour for fuel! Q. Why can't I have more than 32 characters and spaces on my banner? A. Because of the aircraft's safety limit on drag. Any more and the aircraft may not fly! Finally, towing banners is one of the most challenging jobs in aviation, which is why so few pilots actually do it. It is the aviation equivalent of rally-driving. 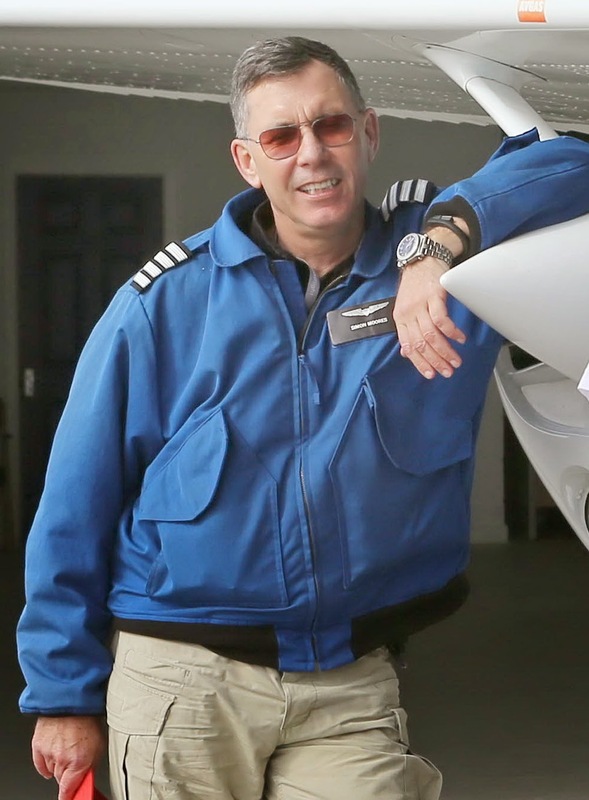 Conditions are rarely perfect and so clients should be aware that while the great majority of flights go according to to plan and to the minute, there can be occasions when delays will occur in circumstances beyond our control. Another successful marriage proposal at the end of Brighton Pier today with Paul Davies popping the question to to his partner Emily Rose. They certainly chose the perfect weather for their most romantic day out to the seaside. Brighton beach reminded me of the south of France and may have been hotter! Airads are back again on Sunday with a banner for 'Moshi Moshi' along Brighton seafront. A banner for his Holiness, the Pope was the first request of the day but without a little divine intervention, it's not possible and I doubt the Lord himself could convince the authorities to allow me to overfly the Papal motorcade in either London or Birmingham. Instead then, we'll be flying a banner for 'Moshi Moshi' over Brighton beach this Saturday and the weather looks set to deliver another scorcher with some thunderstorms thrown in for good measure!